Yeah, you’ve probably heard this track by now. But let’s just have a post where we talk about it anyway, y’know? And off paper? Solid soundtrack fare – hard to fault, doesn’t call much attention to itself. Swift bends to the earthier, eerier style of her collaborators, producing a lullaby whose minor cadences give lie to its lyrics’ assurance of peace and security. That tension plays especially well if you’re familiar with the book/movie’s storyline, but it works outside that context, too. Meanwhile, Swift’s ghostly sigh can’t quite match The Civil Wars’ for impact (ghostly sighing is like their #1 thing, after all), but her youthful timbre does nicely evoke the story’s protagonists, who are themselves young people ensnared in dark circumstances. All in all, it makes for a pleasant preview of the T-Bone Burnett-helmed soundtrack, which – with expected tracks from Pistol Annies, Punch Brothers, The Decemberists, Carolina Chocolate Drops, The Secret Sisters, and Neko Case, plus another from Swift – could well end up being one of the year’s cooler albums. May the odds be ever in our favor. Confession: I knew nothing about The Hunger Games book series before hearing about this movie, but apparently my brother and sister are nuts about it. I like the track well enough, though I need to give it a few more listens to really pin down why. I would have preferred the lead vocals to have been more evenly spread out between Swift and The Civil Wars, but on the other hand, the track does favor The Civil Wars style far more than Swift’s. At any rate, the soundtrack sounds like it will be very cool, and I look forward to hearing the rest of it. Anyway, great review. Very well thought-out. I *love* the Hunger Games, and can’t wait for this movie. I may or may not be a teenage girl. In other news, this song actually disappointed me. I expected much more from Swift and Civil Wars, both of whom I love individually. It’s good, but it could have been great. Does anyone know if this is being pushed to country radio? This is one of my favorite Taylor songs yet, and I’m a pretty big fan. I think that the addition of The Civil Wars was inspired, for the reasons Dan mentioned. I like the eerie, almost creepy, feel of the song. 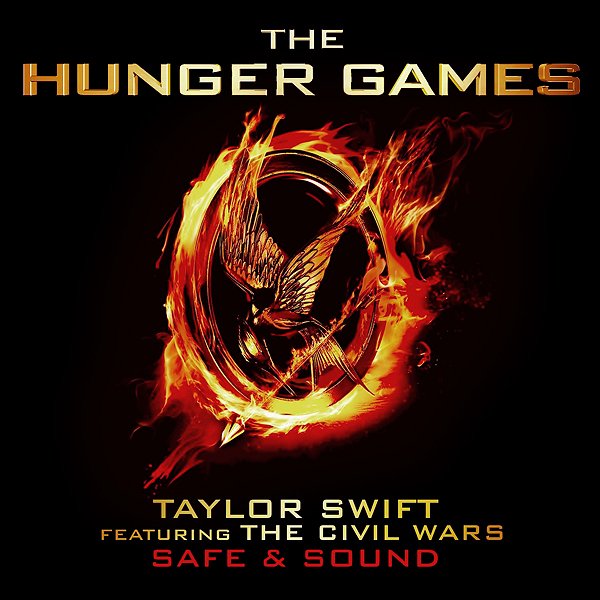 I’m also a big fan of The Hunger Games, so this song is just perfect for me. I really want this song played during the scene with Rue. I can see it being played in the cave scene with Peeta though. The Civil Wars need to keep recording, because Barton Hollow was a borderline perfect album. Everything they do is just mesmerizing. As cool as the soundtrack sounds, I hope they do a good job of not making it invasive in the movie. One of the things that’s so great about the book is how, once the protagonist enters the “action” (I won’t be more specific so as to avoid spoiling anything), you’re there with her the whole time, following only her actions and train of thought. The book never distracts you. Good point, Dan. But when I reread “The Hunger Games” last weekend, I couldn’t help but imagine this song sounding perfect during those parts. Hopefully, if they do play parts of the songs during the movie, it’s instrumental or doesn’t take away from the importance of the scenes. I think the song is beautiful, regardless of whether you think of it in relation to the movie or not. Also I believe the reason Swift is featured as the main singer is originally it was one of the songs she was supposed to do for the Hunger Games, and She and T-bone brought the Civil Wars in later. This is what seems to come thru if you watch the behind the scenes videos for the music video. And both Swift and TCW speak highly of one another. It seems it was a very mutually satisfying collaboration, both during and after the process. Beautiful song. I was surprised at the collaboration, but I think by singing in their “style” Taylor has bridged the aesthetic gap. I love this song, although there are some things about it that I feel are off. Joy and John Paul come across more like backup singers than featured artists, for one. In fact, you can barely even hear Joy during some parts of the harmony. And maybe it’s just me, but I’m getting tired of Taylor talking about people’s “lights” and how they ~shine. Just based on her lyrical style, it seems like she had a very heavy hand in writing the first verse, which I think is the weaker of the two. I just find it a little corny, for lack of a better word. Other than that, Taylor has never sounded better. She should really consider sticking to this style of music because it suits her so, SO well. I love this song! Most people who have something bad about this song is crazy! Its amazing, and people who cant hear the beauty in it is just….. I DO wish they’d brought TCWs up in the mix a bit vocally (I agree with whoever said that Joy was hard to hear) and it would have been nice to hear them sing a verse together without Taylor, but either way, I think this is a really fantastic track that will do nothing but help all involved. well Adam to be fair, it was her song to begin with, and according to the way TCW and Taylor tell it, Taylor asked them to be part of it unless I read the story wrong. I think the song sounds beautiful just as it is; too easy to bow to the popular sentiment that she has a bad voice just because she doesn’t have the voice of a Martina McBride or other powerhouses. Not that you said anything negative about her voice, but usually that’s what those who don’t like her use as one of the main reasons for their dislike. I get what you’re saying June. I didn’t know she wrote it. Honestly, I think Taylor’s an excellent songwriter, her voice is only one thing that keeps me from really listening to her. If she weren’t doing such perfect pop-type country (where a good to decent voice is really kind of important) and were doing more the kind of stuff TCW were doing, I wouldn’t mind it as much. In a way, it would probably be BETTER if she were doing more alt-country and didn’t have a Martina-like voice (imagining Martina singing a Jayhawks song is just jokes lol!) In a way I can’t wait until she grows up a bit more, because as it is now, I feel like I’m not really her target audience, and that too keeps me from really listening to her. I’m a guy, a few years out of college and I feel like she writes for a much younger audience than me, so while I can appreciate her songs, I find them somewhat hard to relate to. But this song is an exception.